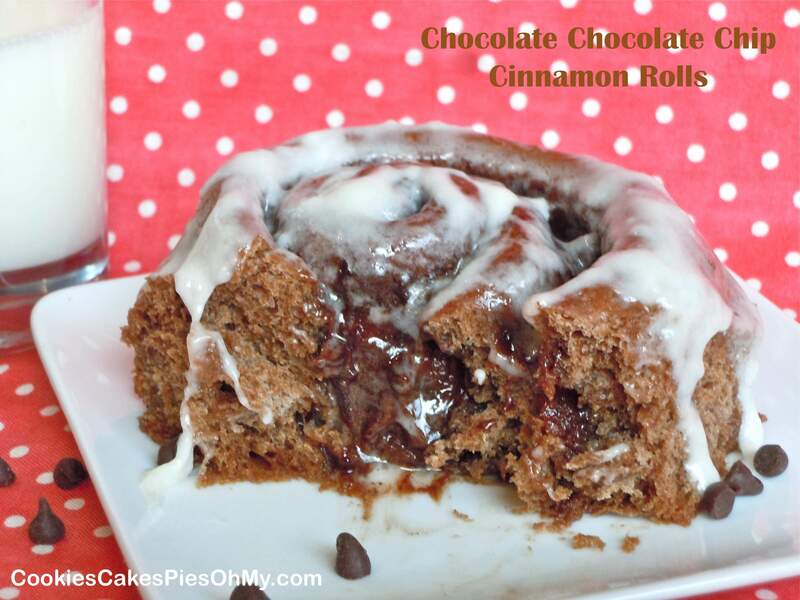 Love, love, love dipping things in chocolate! Melt white chocolate slowly in double boiler over low heat or in microwave. Transfer to large bowl, add gingersnap crumbs, pumpkin, graham cracker crumbs, sugar, orange zest, cinnamon, salt, and cream cheese and beat with electric mixer until smooth. Transfer to shallow bowl, cover and chill until solid enough to roll into balls (about 2 hours). Scoop pumpkin mixture into balls, roll in hands if desired to make smooth, place on silpat, cover with with plastic and freeze. Line a large tray with parchment paper or silpat. Melt semi-sweet chocolate and shortening and transfer to small, deep bowl. 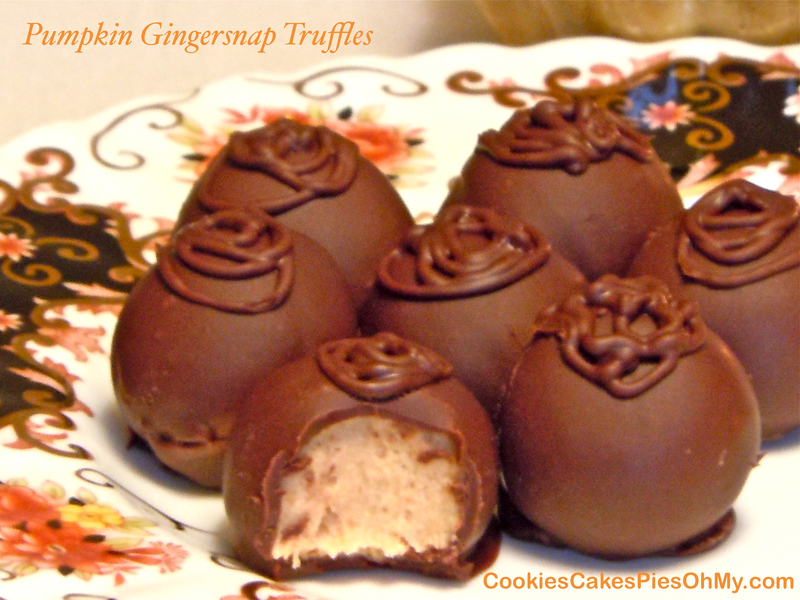 Work with about six pumpkin balls at a time (remaining put back in freezer) drop into the chocolate. Work quickly, gently spoon chocolate over to coat. Using two forks, lift truffle out of chocolate, shake off excess and transfer to prepared tray. Continue with remaining pumpkin balls. Put remaining chocolate in ziplock bag, snip corner, and drizzle swirl of chocolate in a design on top of each truffle. Put tray in refrigerator for truffles to set up. Store truffles in airtight container in refrigerator. 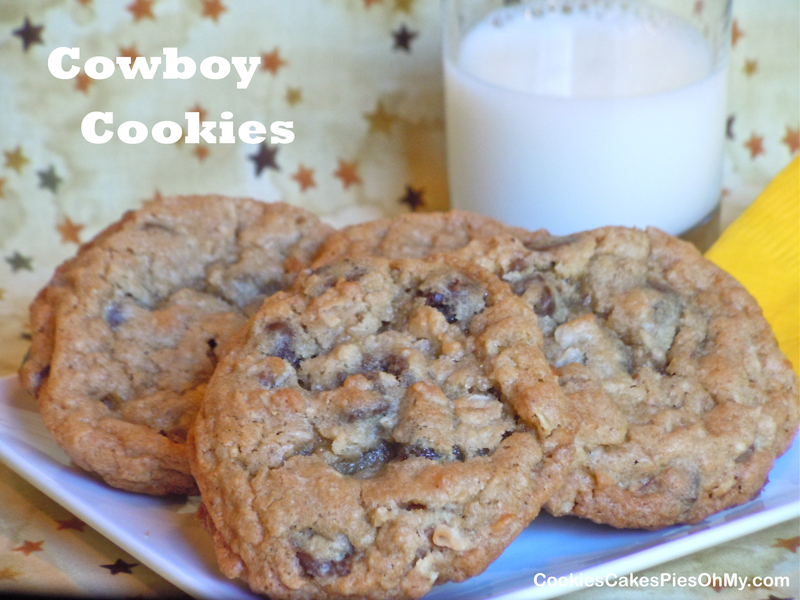 Why are they called Cowboy Cookies, I don’t know. My Grandpa was a cowboy. He and my Grandma had Palomino horses, rode on silver saddles and he was a Sheriff for the King County Mounted Police. I think Grandpa would have liked these cookies. Preheat oven to 350°. In large bowl with electric mixer, cream butter, sugar, and brown sugar. Add eggs and vanilla, mix well. Add flour, oats, baking soda, salt, and baking powder, mix just until combined. Stir in chocolate chips, coconut, and pecans. Bake on Silpat lined baking sheet or lightly sprayed cookies sheet for 10-12 minutes, until golden brown. Cool on baking sheet for 5 minutes, then cool on wire rack. Makes about 4½ dozen cookies. I have had this recipe on my “To Make” document for a long time. I finally remembered to pick up some dried cherries and YES, these are good! Delicious combination of tart and sweet. Recipe from myrecipes.com. Preheat oven to 350°. 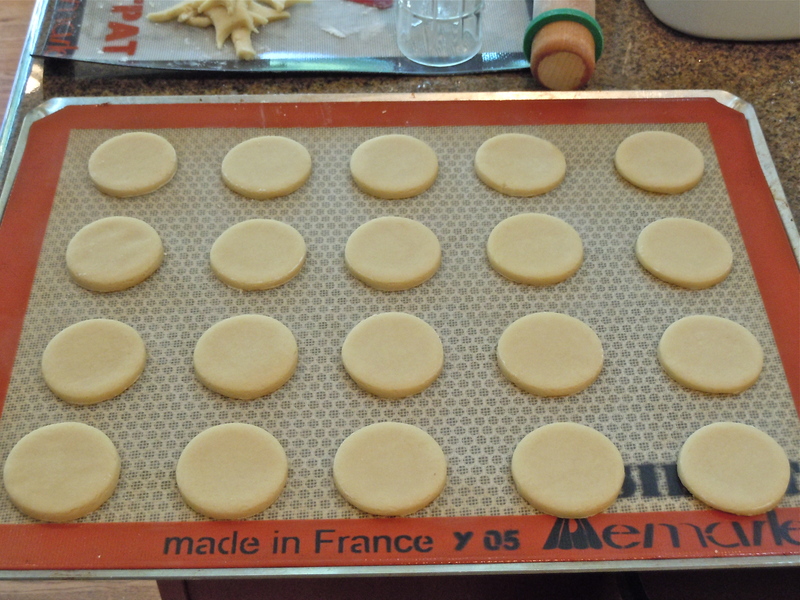 Spray cookie sheet with nonstick spray or line sheet with Silpat. 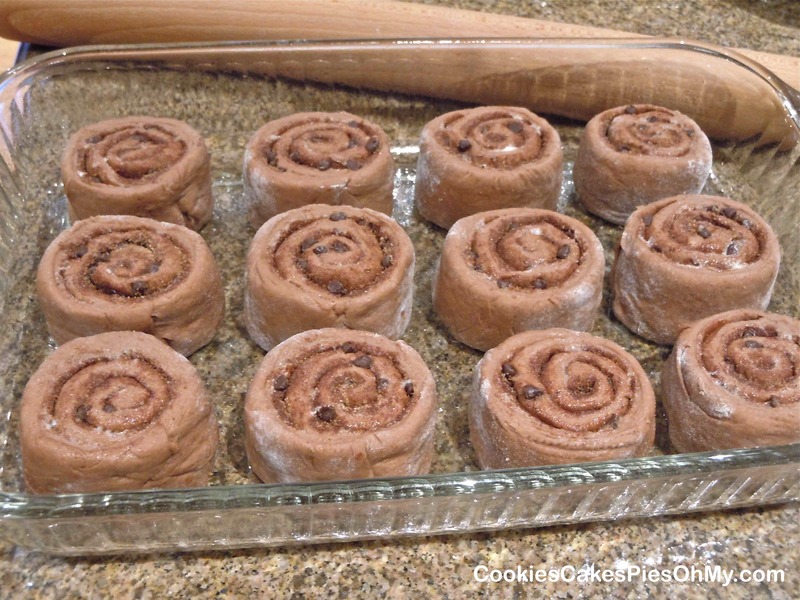 Whisk together flour, cocoa, baking powder, baking soda, and salt in medium bowl. In large bowl, cream sugar and butter with electric mixer until well blended. Beat in vanilla and egg. Slowly mix in flour mixture, beat just until combined. Fold in cherries and chocolate chips. 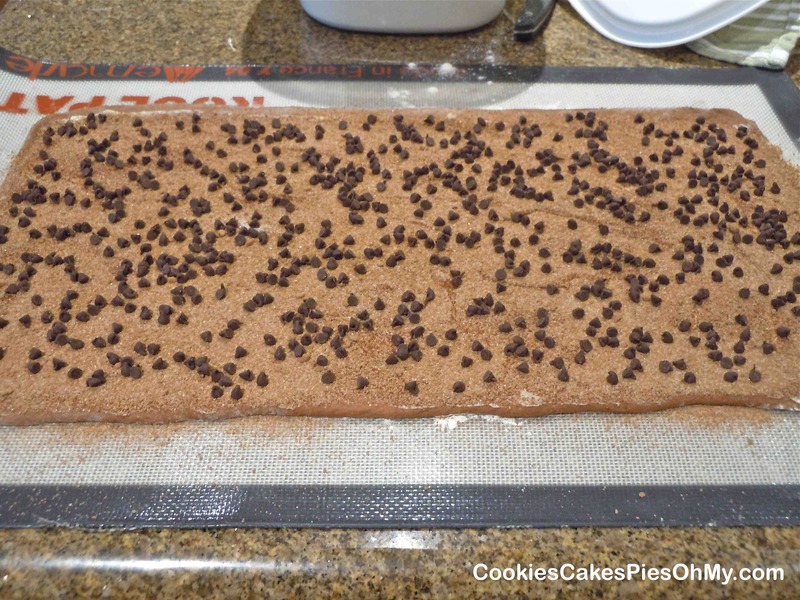 Drop by scoopfuls onto prepared baking sheet. Bake 12 minutes or just until set. My son saw a picture on Imgur that looked something like what we did here. 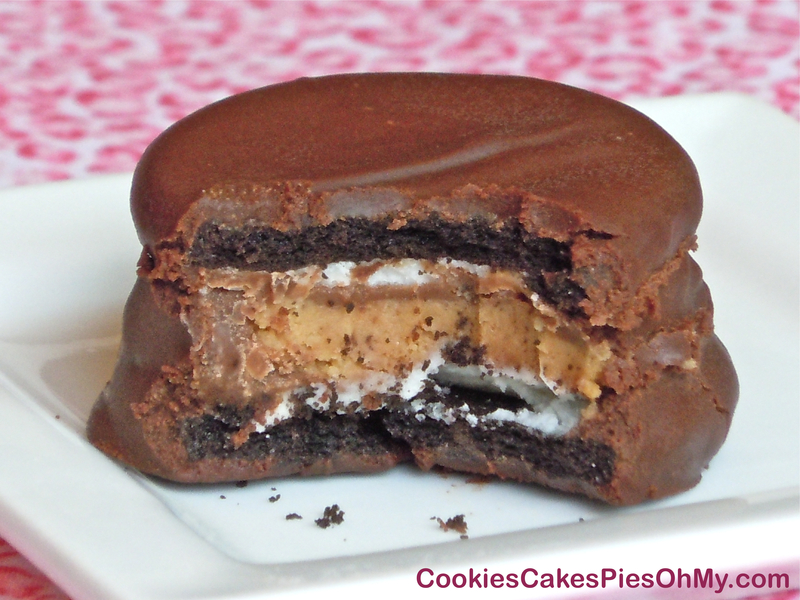 A Reese’s Peanut Butter Cup sandwiched between Oreos (we used two Oreos, take apart and use the two halves with filling to make filling above and below) then dipped in melted semi-sweet chocolate. Wow, thanks to whoever came up with this idea, a fun treat! 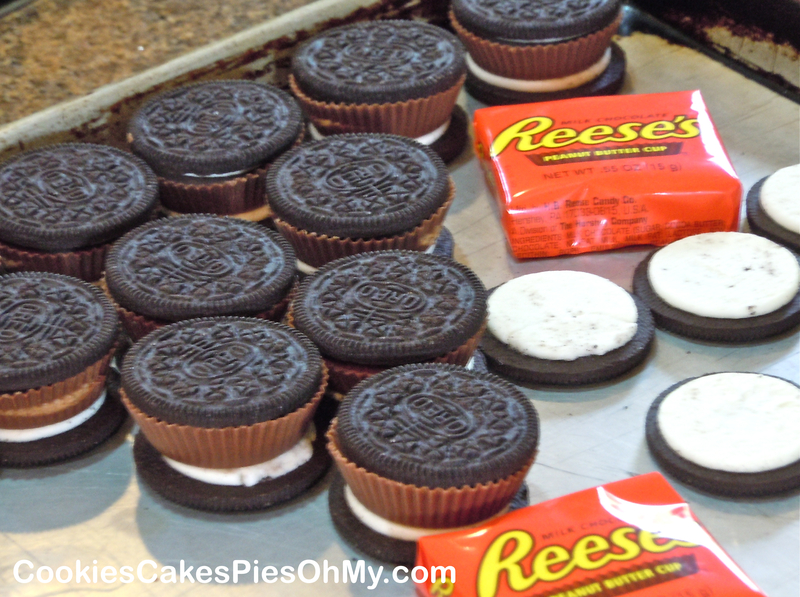 Make 12 Peanut Butter Cup Oreo sandwiches by placing a Reese’s between two halves of Oreo’s with the filling. Melt chocolate chips and shortening over a double boiler, turn off heat and cool just a bit. If you dip the sandwiches in the chocolate when it is too hot, it will start to melt the Reese’s. Cover each sandwich completely with chocolate and set on Silpat lined sheet, parchment, or wax paper. Refrigerate to set up chocolate. 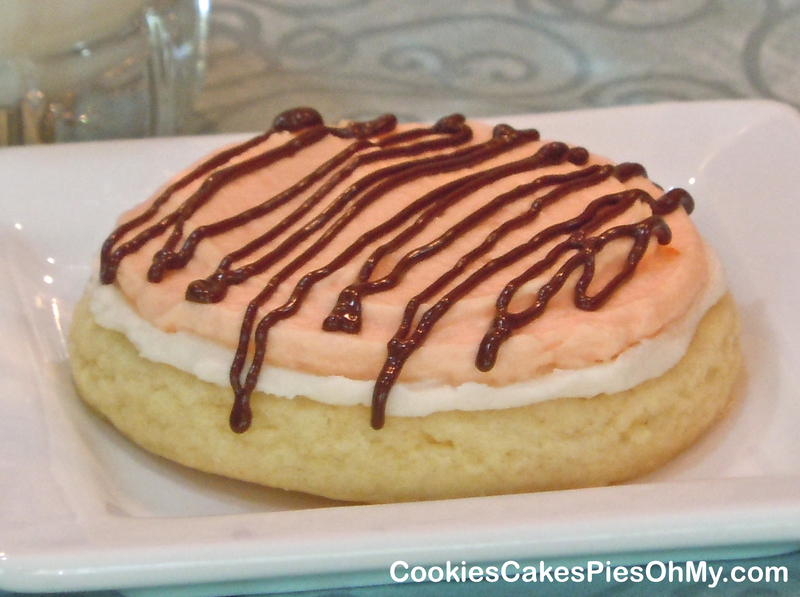 Another double frosted cookie. I can’t help myself, I love the way they look…and taste! The cookies seem to say, one layer of frosting just isn’t enough, we are going to the extreme. And, because I love the flavor combination of orange and chocolate (got that from my dad), I drizzled some with melted chocolate. Oh, yum! Preheat oven to 400°. In large bowl with electric mixer, cream butter and sugar. Add egg and vanilla. Stir together flour, baking powder, baking soda, and salt. Add dry ingredients alternately with cream. 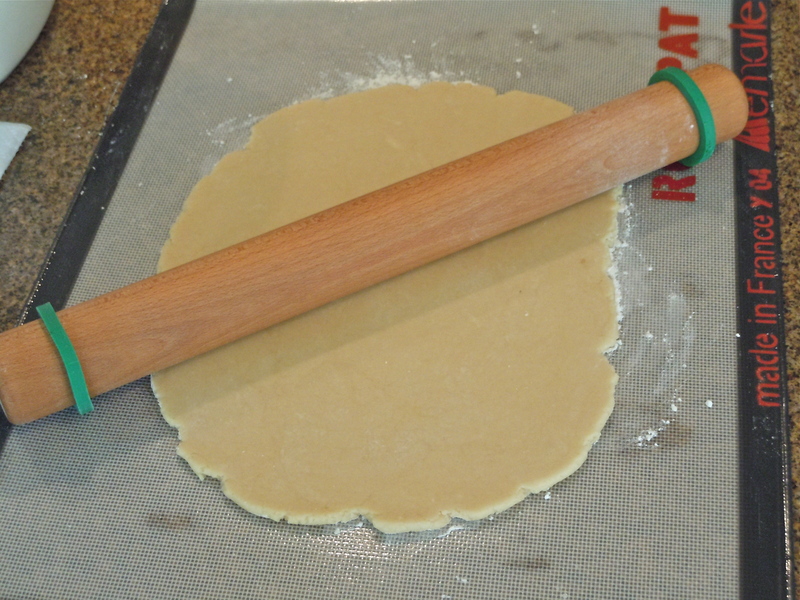 Roll out cookie dough 1/4″ thick, on lightly floured surface. 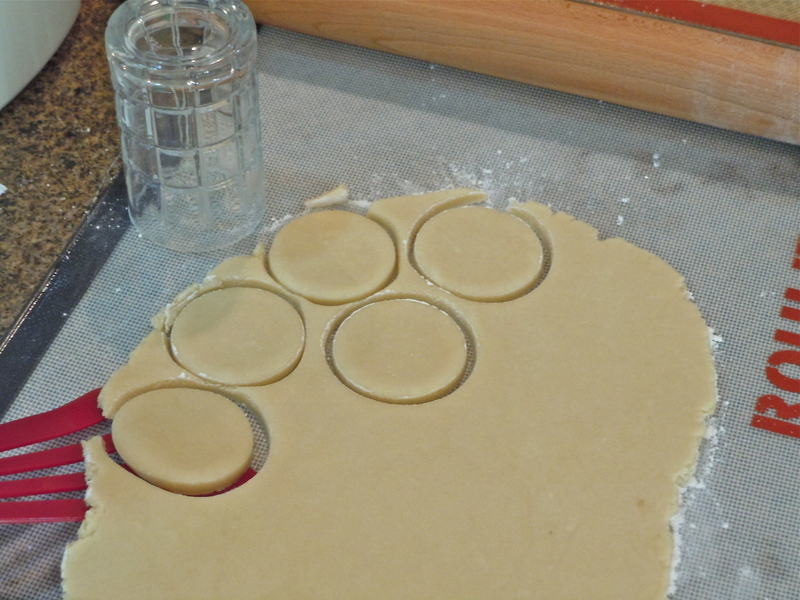 Cut into rounds about 2½″ in diameter and place on silpat lined or lightly sprayed baking sheet. 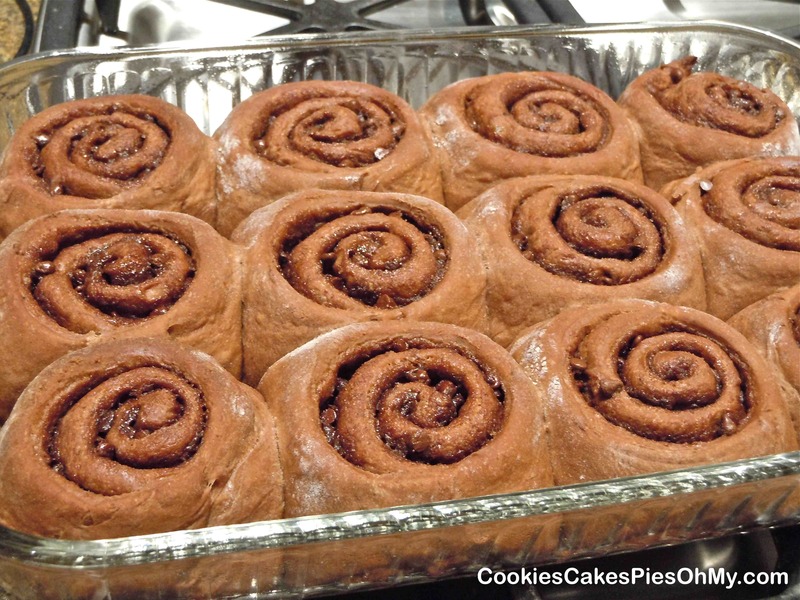 Bake for 5-6 minutes, (I bake them exactly 5 minutes). DO NOT OVERBAKE. They will be nice & soft if you don’t overbake. Cool completely before frosting. Cream butter, shortening, and vanilla with electric mixer. Slowly mix in powdered sugar one cup at a time. 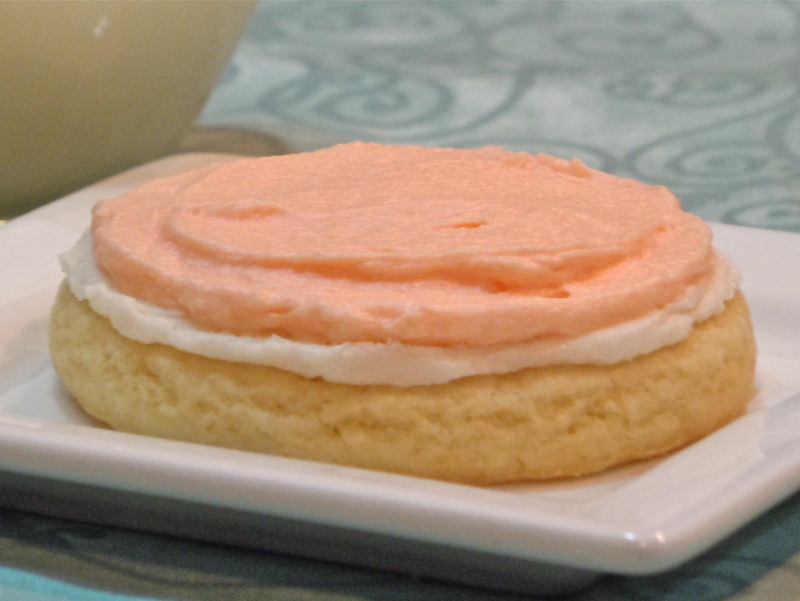 Add cream to make perfect spreading consistency (this frosting layer can be a little firmer than the top layer). Frost cooled cookies. 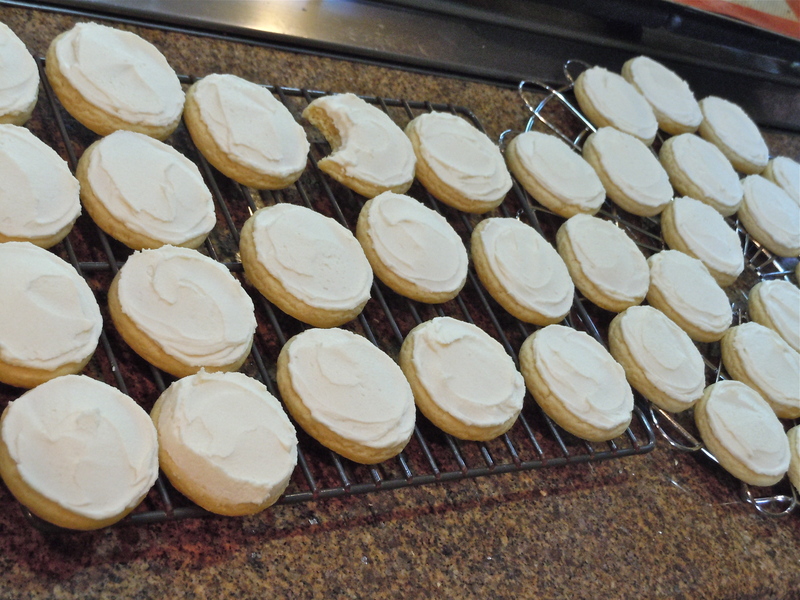 Let cookies sit until frosting set enough to frost with orange frosting layer. Mix butter, powdered sugar, orange juice, and vanilla with electric mixer. Add and mix in drops of food coloring one at a time to achieve desired orange (I used 5 drops each of yellow & red). 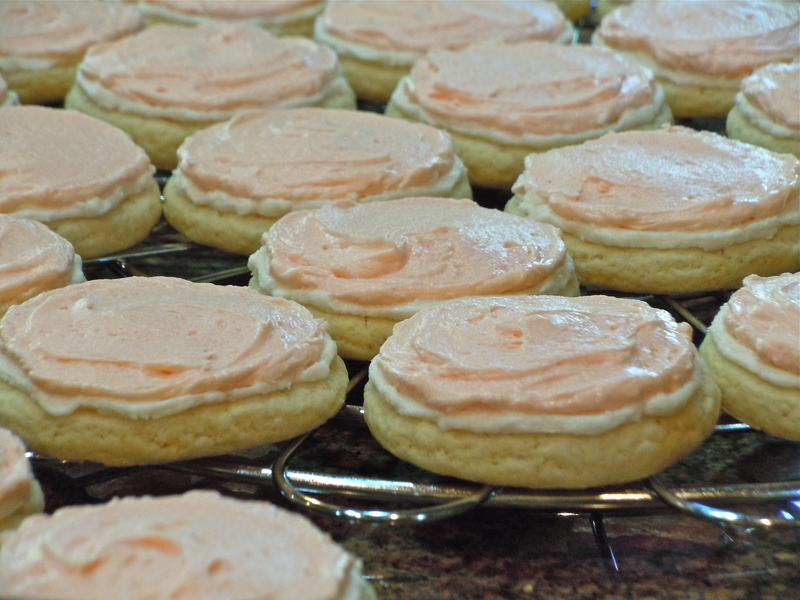 Spread layer of orange frosting over cream frosting on each cookie. 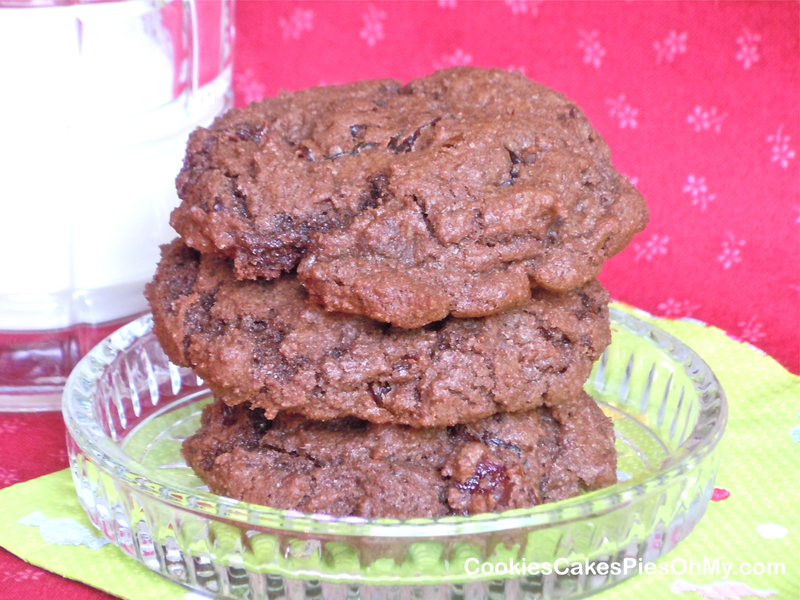 Melt 1/4 cup semi-sweet chocolate chips in microwave and drizzle over cookies if desired. 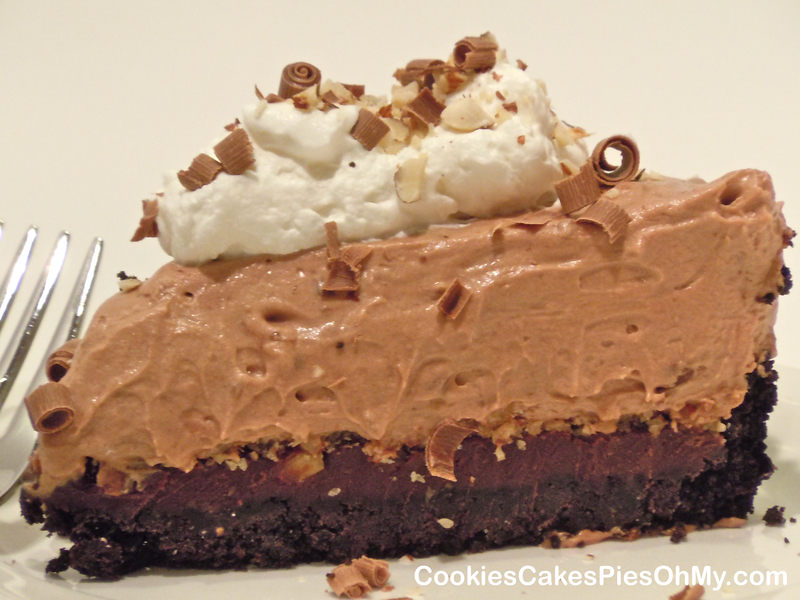 This is a recipe that I grew up with, a family favorite. It is from pillsbury.com they call them bars but to me it is cake. 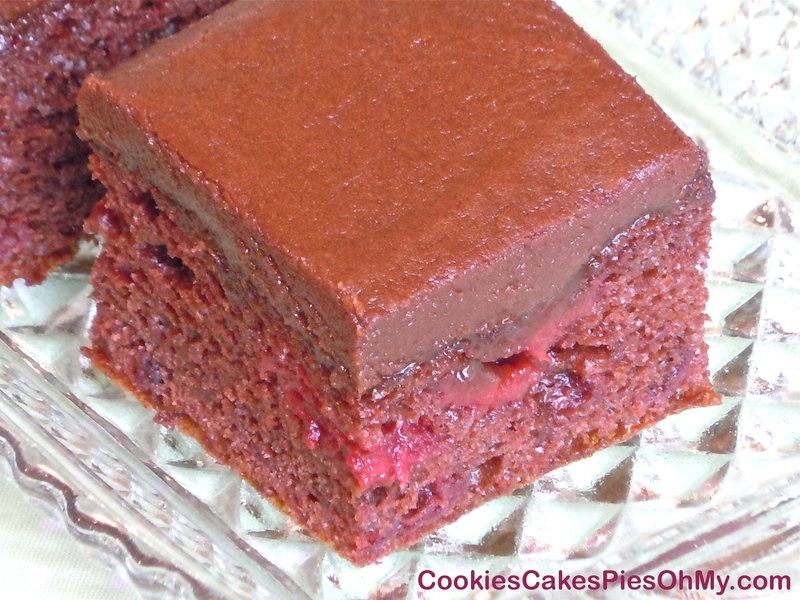 It is an incredibly moist fudgy cake with bites of sweet cherry, and a ganache like frosting. 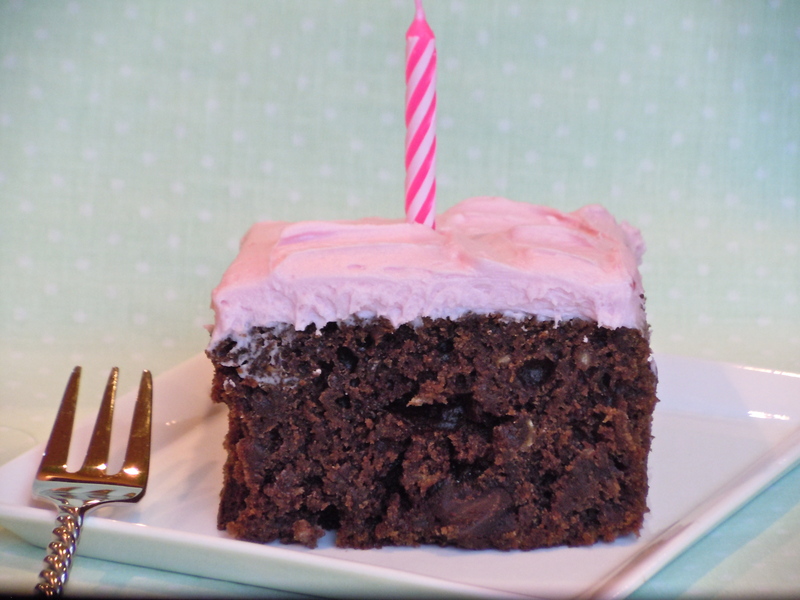 Make a 13″x9″ cake or a sheet cake to feed more. 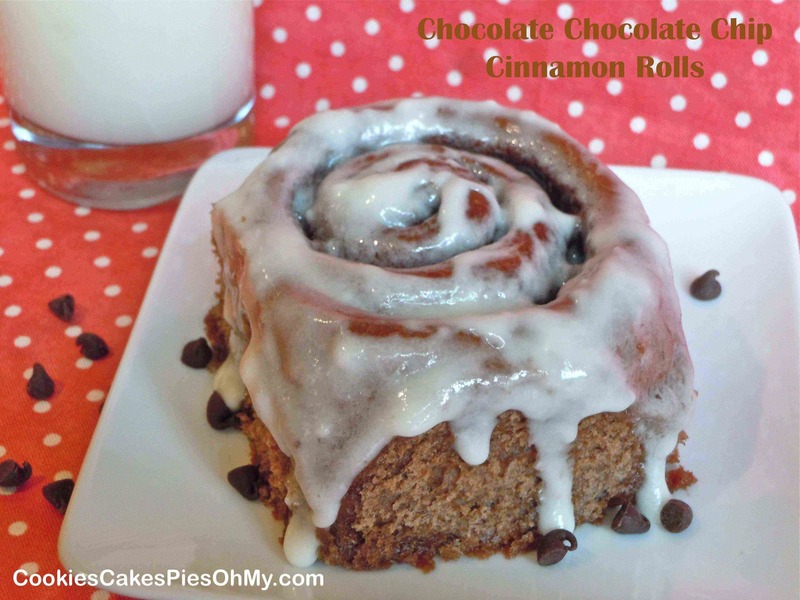 A quick fix for dessert at home or travels well to take and share with others. Preheat oven to 350°. Decide whether you will use a 13″x9″ pan or 15″x10″ sheet pan, spray with non-stick cooking spray and flour. In large bowl with electric mixer, combine cake mix, cherry pie filling, almond extract, and eggs. Mix until well combined. 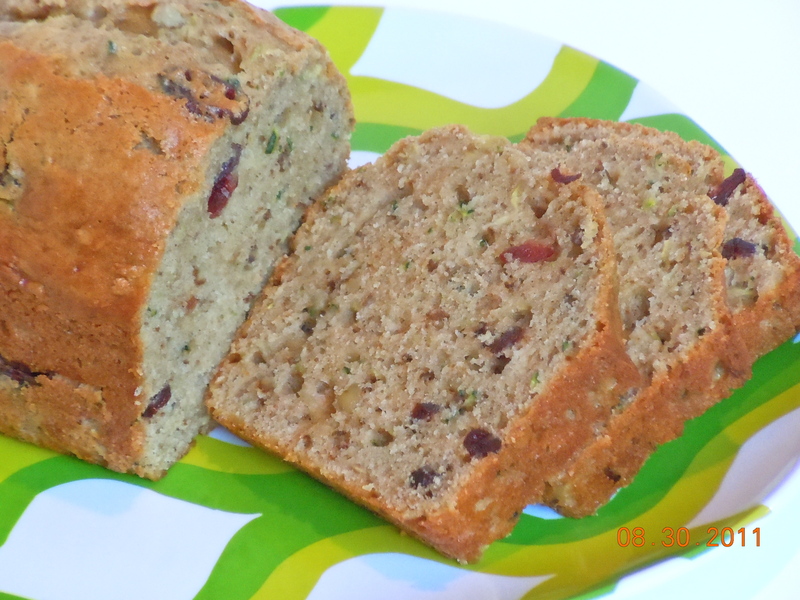 Pour into prepared pan and bake for 25-35 minutes for 13″x9″ and 20-30 minutes for 15″x10″. Watch carefully and test with toothpick in center to come out clean. Make frosting. In small saucepan, combine butter, sugar, and milk. Bring to boil. Boil 1 minute, stirring constantly. Remove from heat and stir in chocolate chips until smooth. Pour and spread over warm cake. Cool completely. It’s my birthday and I am making myself a cake. 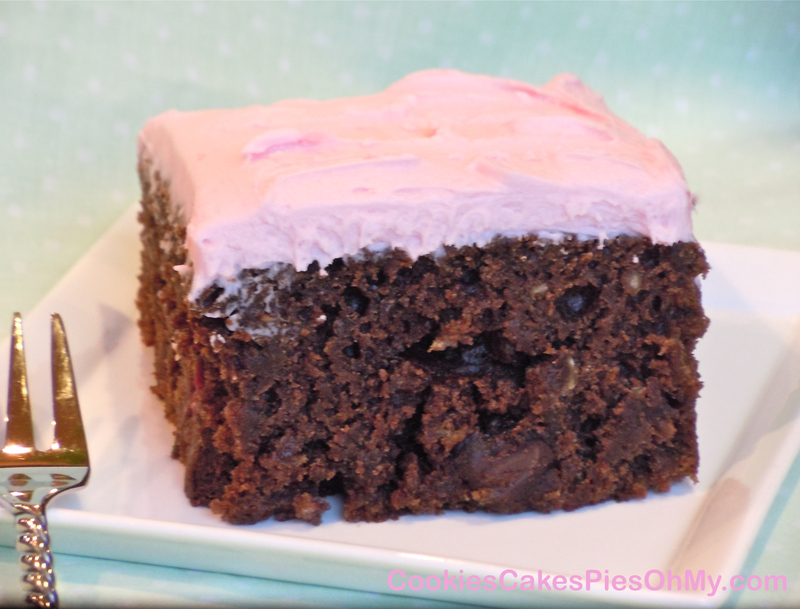 Chocolate Oat Snack Cake is a favorite of mine, so I used that recipe and added raspberries and raspberry buttercream frosting. Oh wow, my sweet husband just walked in (literally while I was typing this, I will add a picture!) 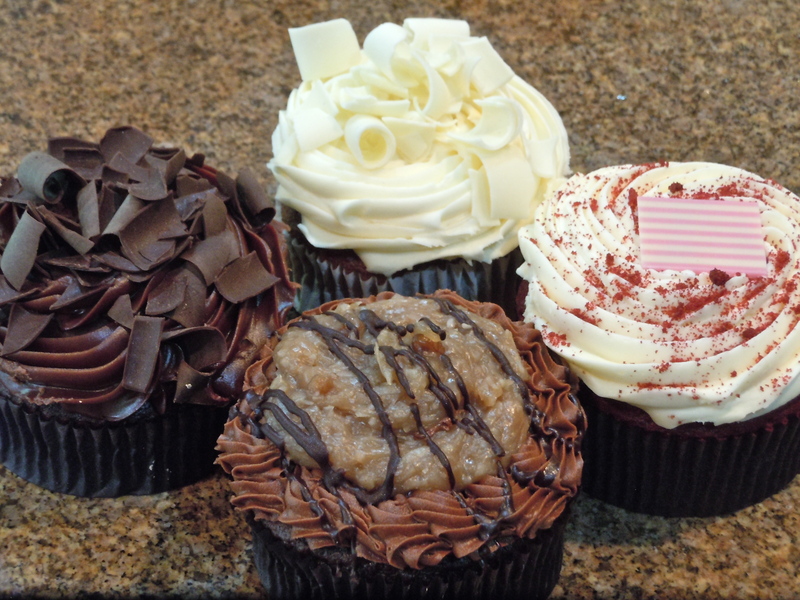 with a birthday surprise of four beautiful large different flavor cupcakes. Now I have yummy cupcakes and my cake! Happy Birthday to me…I love cake, hope you do too! Preheat oven to 350°. In medium bowl, pour boiling water over oats, let stand 10 minutes. In large bowl with electric mixer, cream butter and sugar, and brown sugar. Add eggs, beat well. Beat in oat mixture. 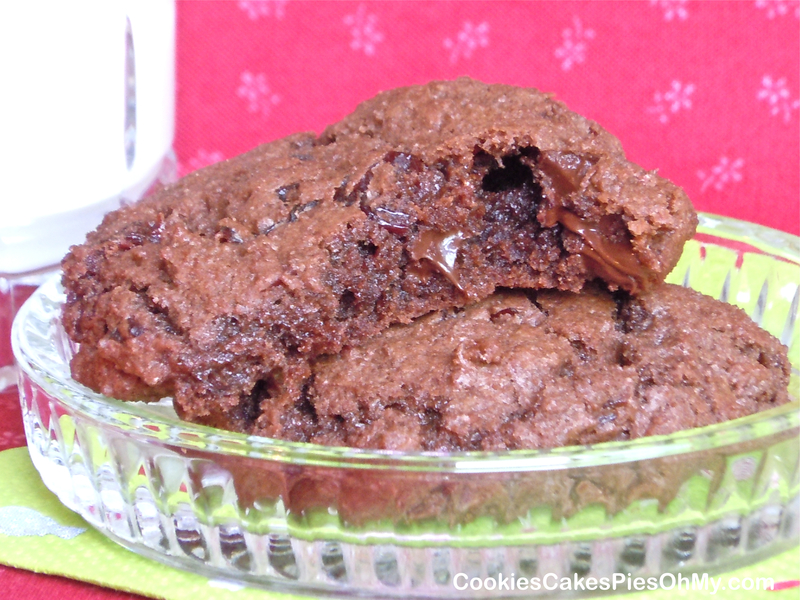 Combine flour, cocoa, baking soda and salt, gradually add to creamed mixture. 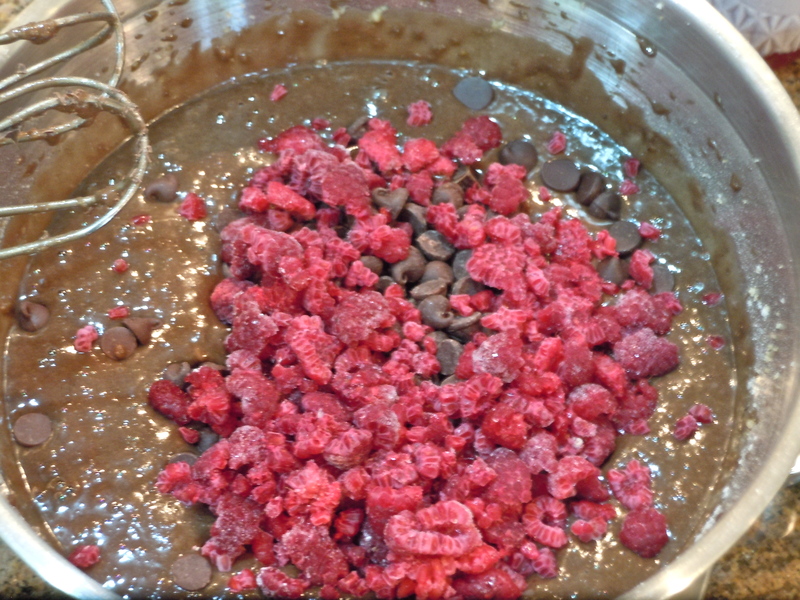 Stir in semi-sweet chips, dark chocolate chips, and raspberries (as you add frozen raspberries pinch each one so they break apart into small pieces). Pour into sprayed 13x 9 baking pan. Bake at 350° for 38-40 minutes or until a toothpick comes out clean. Cool on wire rack. Frost when completely cool. Whip all ingredients together with electric mixer. Spread over completely cooled cake. When you want to make cookies, you have to decide what kind to make. Today I just could not decide, I felt like a little bit of everything. I like the chewiness of oatmeal, I love coconut, gotta have chocolate (can’t decide, I’ll use white, milk, semi-sweet and dark), a little tart from cranberry, and crunch from nuts. My 1/2 cup measuring cup was very busy today! Preheat oven to 375°. In medium bowl, stir together flour, oats, baking soda, cinnamon, and salt. In large bowl with electric mixer, cream butter, sugar, and brown sugar. Mix in eggs and vanilla. Mix dry ingredients into creamed mixture. 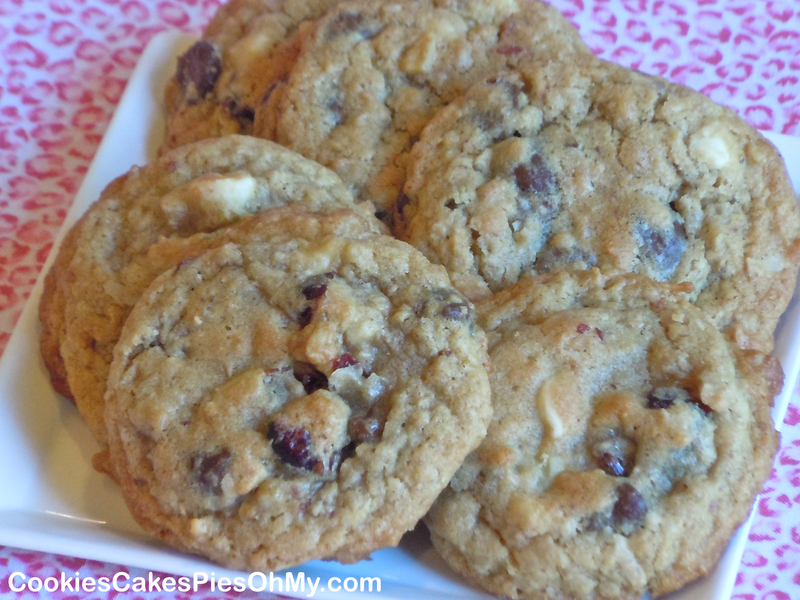 Stir in coconut, cranberries, white chips, milk chocolate chips, semi-sweet chips, dark chocolate chips, and walnuts. 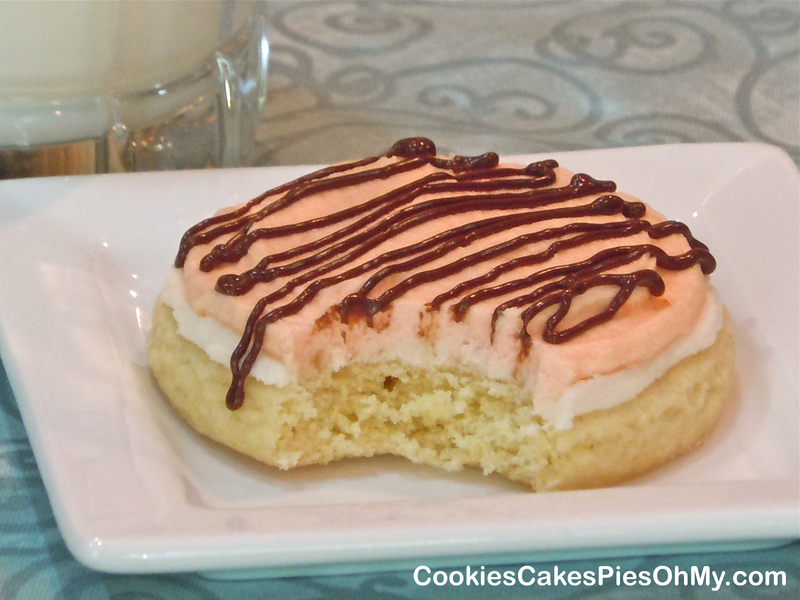 Drop by scoopfuls onto Silpat lined perforated sheet or cookie sheet. Bake for 8-10 minutes (I say 8-10 minutes, ovens differ, but in mine 8 minutes was just right, don’t want to overbake them).